Germfree provides Custom Pharmaceutical Isolators for both Aseptic and Containment applications. We manufacture and test our barrier systems to meet all appropriate guidelines and specifications. Units are fully engineered to harmonize filtration requirements with integrated components. Pharmaceutical and Biopharmaceutical production often requires working with potent APIs and hazardous biological agents. 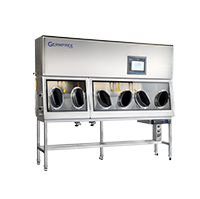 Germfree’s Custom Pharmaceutical Containment Isolators facilitate the ideal workflow and cGMP-compliance while providing protection from risk agents. We provide Restricted Access Barrier Systems (RABS) for sterile product processing. These units offer flexible options for aseptic controls when a Pharmaceutical Isolator is not required. RABS mitigate the risk of contamination to sterile materials, containers, vials or surfaces that may come into contact with the product. 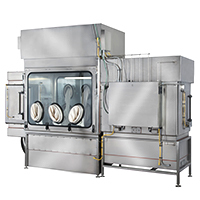 Our units are custom manufactured to meet the demands of any pharmaceutical or biopharmaceutical application. They range in size, process-flow, and requirements for air filtration.